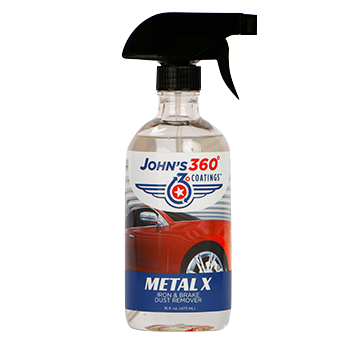 16oz — John’s 360° Coatings® Metal X Iron and Brake Dust Remover thoroughly decontaminates wheels, metal and painted surface. Metal X gets rid of brakes dust, iron particles and exhaust particles. Simply spray on and rinse off with water or for best results wipe off using John’s 360° Decon Spray.